As a homeschooling mom of 5, and an avid reader, books play an important role in our family, and I keep our bookshelves stocked with lots and lots of books for both myself and my kids. As a kid I always loved getting new books and now I love to take my kids to the bookstore to wander the aisles and find new books to read. Buying books, however, can get pricey quickly so I have put together some tips and tricks to getting books at more reasonable prices. 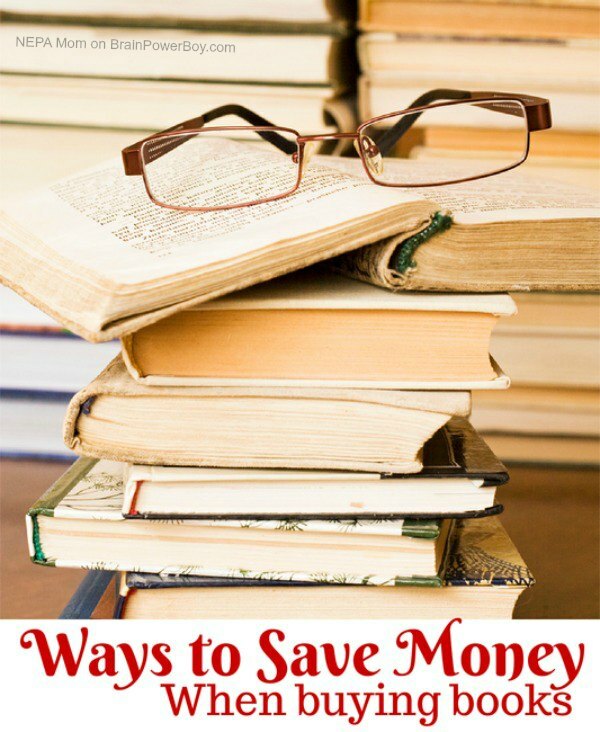 Here are my ways to save on buying books. Shop at yard sales and church flea markets. Many people don’t know what to do with books after they have read them so yard sales and flea markets are a great place to pick up gently used books. Sign up for Amazon Prime (Join Amazon Prime – Start Free Trial Now ) and buy your books online. I find that this helps cut down on impulse buys because I don’t get distracted by strategically placed tables and advertisements. When shopping online I tend to log in, get the book I want, and then get out. Don’t forget to use cash back sites like Ebates when shopping online. Don’t buy new releases–I know, I know it’s so tempting to buy the newest book that everyone is raving about BUT if you wait a few weeks or months you will get a better deal since the demand isn’t as high. If you absolutely must read that new release, then use your local library. Libraries are a great way to find new authors or to pick up books for your kids. If they happen to really like a particular book or author then you can purchase them at a store or online. If they happen to despise a book or an author then it hasn’t cost you anything. If you are purchasing children’s books, sign up for Educents. This is a daily deal site that offers books and educational materials. It is a great way to save money on books but don’t fall into the trap of buying something just because it is a good deal. If you prefer to download your books for free then make sure to check out the free books available on Amazon each day. A few times a week I post on my site the free books and it is a great way to try out new authors or genres without any commitment. I also like to download cookbooks, pick out the recipes I want to try, save them on my device or print them out and then delete them from my history. Thanks for sharing your tips, Megan. It is always great to see how someone else saves some money on an important item like books. Go check out Megan’s blog NEPA Mom for more great ways to save time and money in your busy life. Megan is from Northeast Pennsylvania, is married, and has 5 children. She blogs about homeschooling, ways to save money, family travel, and shares kid-friendly easy recipes. You really must go to her recipes section and see the Kit Kat Chocolate Cake. Oh My! This was very helpful! We have been using the library so much more lately and love it. I have heard about Amazon Prime a lot lately. I might have to use this free trial. Thank you for great information! Megan did a great job, didn’t she. I found a few helpful tips myself. We are big library users but owning books is also important to us. I am not sure Amazon Prime cuts down on my impulse buys, but that may just be because I hate to leave the house and two day shipping is WONDERFUL. You would be amazed at what you can get at thrift stores and yard sales. Great tips!! Good point on Amazon Prime–I think it would likely make it easier to order more LOL. Such good advice – especially about not buying new releases – I can’t tell you how many of those are still sitting on the shelf unread!